BLAZING HOT! These will be the two words forever associated with the 2012 Boston Marathon. Let me reiterate....it was blazing hot!!! The day lived up to all the email hype from the BAA, they say the temperature topped at 89 degrees at 12:30 on the course. With a race that starts at 10 am, unless you are elite, you are still on the course at 12:30 pm. I slept quite well the night before. I was a little unsettled about what to wear because of the heat. I ended up buying something else at the expo and wearing it. The day ended in a bit of a fiasco. 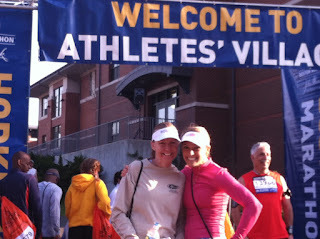 The food was marginal, not great pre-race, and we had an unbelievable 2 1/2 hour ordeal trying to return the rental car. My emotions were getting pretty high. I was just wishing Brent was there. When he is around pre-race I don't have to think about anything. Probably you would think I was an olympian the way he dotes and scurries to meet my needs. He wasn't and I keenly felt his absence. We didn't end up driving the course which was a disappointment to me as well. I moved into my own room. Took a bath and watched youtube videos of the course. Brent arrived at 2 am, I didn't wake up. well as all the scare tactics about the heat! At 5:20 my alarm went off. Got dressed. Decided not to take any caffeine because of the remote possibility of speeding dehydration. Ate a small bowl of steel cut oats, softened in water. Drank a water bottle full of water and then a bottle of gatorade. Brent woke up and we went downstairs and met Mckenzie and Josse in the lobby at 6 am. We chit-chatted a bit and then headed to the park for bus pickup to athlete's village. Brent walked us down, gave me a good luck kiss and left. We waited only 20 minutes or so for a bus. It was at this dreadful moment I think I must have put my phone down, never to be seen again. Josse and I sat together on the bus. The only topic of conversation amongst anyone was the heat. What to do? How to approach the race? I thought we had it dialed in. McKenzie and Melody would start in my corral, instead of ahead. 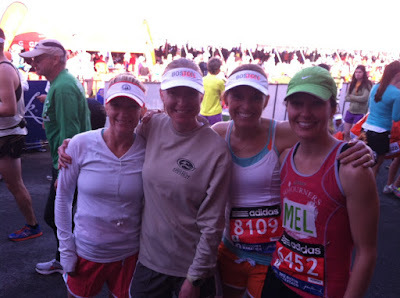 We would all go out together at around a 3:30 pace for the first 5-10 miles. Keep each other cool and safe and slow. Then let the race and our bodies determine the rest. This was a significant change in plans. In a typical race we wouldn't have run together. Everyone has their own strategy. But today was different because of the heat. If you remember, my original plan was to go out shooting for a 3:10. 3:30 was really dialing it back. I thrive on a methodical plan. I am much more controlled when I know what to expect in a race. We arrived at the athletes village. I ate a half a whole wheat bagel, and half a banana. Drank some more gatorade. We found Melody. It was the first time I had seen her all weekend. I found out Emily, the elite whom we got our training program from had decided to defer. 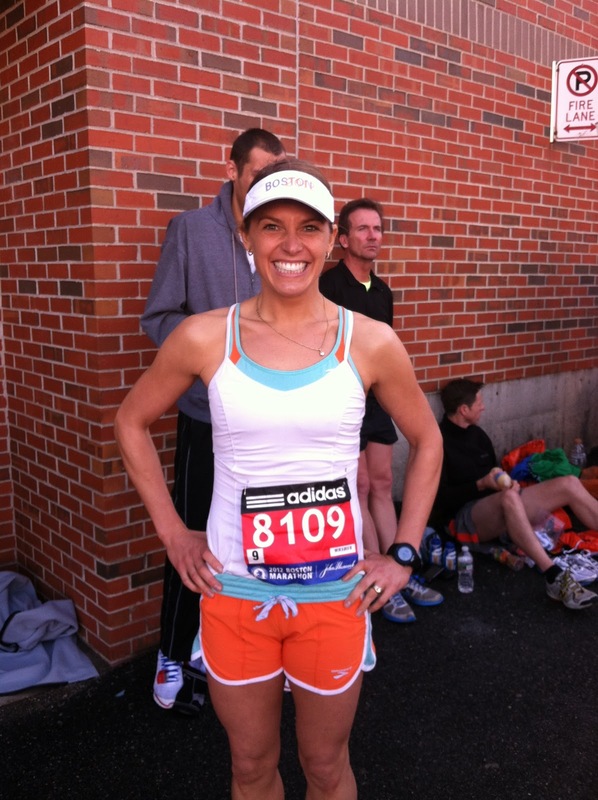 She ran in the heat in Boston 2004 and ended up in the hospital. Melody was pretty quiet in the morning about her plan. I had a suspicion she would probably not start with me. She never told me in person she would, only in a text. But the entire 3 hours up there no one mentioned they were starting alone. I was probably blabbing on and on about how we were we going to help each other and have a great time, douse each other with water... The other girls were probably so focussed on their own plans they didn't notice how I must have created this illusion in my mind of how things were going to go. 9:30 rolled around and we headed to the starting line. 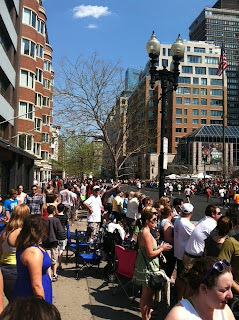 The Boston Marathon had 27,000 runners registered. The runners are divided into 3 heats with 9,000 runners in each. Runners are seeded in their corrals by qualifying times. Mckenzie had the fastest time with a 4,000 number, Melody 6,000 and myself with 8,000. That put us in corrals 5, 7, and 9 respectively. Josse was in the second heat starting 20 minutes after McKenzie and Melody and I. I had told Josse all weekend I just couldn't wait and start with her, the extra 20 minutes of heat just left more time for the temperatures to creep up. The ninth corral was the last. It was definitely a sacrifice to start back, because the runners you are surrounded with, theoretically, are not as fast. As we walked to the corrals locals had set up little tents with water and and markers to write your name on your body (for callouts from the spectators). We soaked our heads and clothing with water to stave off the heat. My heart sunk when I saw corral nine. It was at the bottom of the hill. I could see 5 far up in the distance. (Your time does not start until you cross the starting line, it is a run/walk to the start as they release the corrals about every 45 seconds.) It was then that Melody and McKenzie said goodbye and walked away. I must have had some serious delusional thinking in the days before. I'm not sure what I created in my mind and what made me do it but for some reason I really thought we were all starting together. No one was racing this, at least that is what everyone said. All the emotions of training my guts out for 12 weeks at 5 am, then having a ridiculous aberrant weather day of 85 degrees which made all that training basically useless (because I couldn't race), and then seeing my friends head off to their corrals... I just fell apart. 9:55 the National Anthem plays. 10:00 am race starts. Still crying, wishing it was from joy, I cross the line at 10:07 am. I'm in a mass of people, unlike anything I've run in before. I decided to stay with the idea of going out at a 3:20-3:15 pace which is between a 7:38 and 7:27 minute mile. Most of my training runs were at this pace, so I was confident it would be very comfortable. The masses were a bit overwhelming. Full disclosure: I cried on and off the first 5 miles. I was very hot (no aid station the first mile) the first 2 miles and I was struggling to hit the 7:30's with all the people. In an effort to conserve energy and not add too much distance I kept to the right shoulder of the road. But sometimes I got so frustrated stuck behind people I darted around. I'm not sure why I hated those first miles so much. It seemed to me the crowds were lame and full of people in Kenya t-shirts. 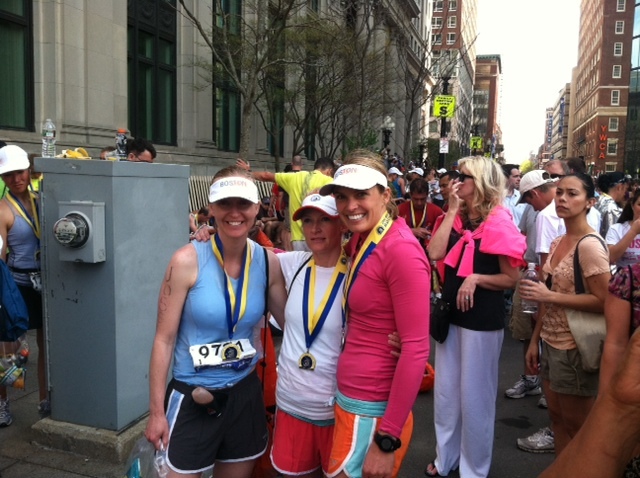 I was certain I would never race Boston again. I began to cool down and get over most of my emotional drama by about 4-5 miles. After mile 2 there were aid stations every mile. I was completely drenched, (complete with soggy shoes, will I ever run a marathon in dry shoes?) and the crowds started to thin a bit. The aid stations were wild. I never really got used to them. I was constantly colliding with people, stopping and starting again. I took a single sip of gatorade every mile and avoided drinking water, to keep my electrolyte balance in check. I used at least 3 cups of water to douse my head and body with water and wash the gatorade off my hands and face. It was a seriously messy operation! I kept close tabs on my watch to make sure I didn't get going too fast, but with all drinking and soaking and people it wasn't too hard. At about 9 miles I ran into McKenzie. I was very surprised to see her as she started 4-5 minutes before me. I slowed down and we chatted for a while. She kept telling me to go ahead. I kept holding back thinking she would pick it up with me, but she was content to keep her pace. It felt too slow for me. I was now at the 10 mile mark and felt ready to stop looking at my watch. I wished her a good race and pressed forward. At this point I was feeling good. I decided to ignore my watch and just be conscious to keep my heart rate down and not breathe hard. 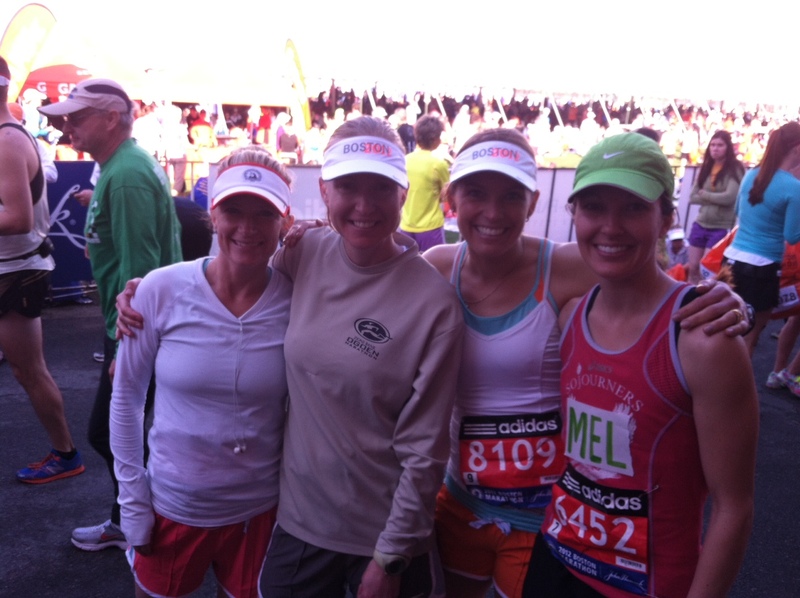 Glancing at the bib numbers surrounding me I began to notice 1,000's and 2,000's. I figured I must be having a pretty good race to have gained so much distance on the faster runners. 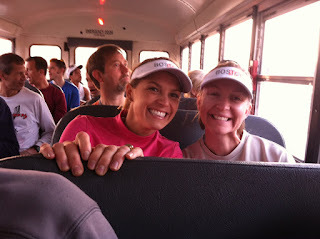 I began working the crowd and had a permanent smile plastered on my face the rest of the course. Unfortunately my name was written on my left arm, and I was running on the right shoulder so I didn't hear my name shouted out constantly as people said I would. I think I expended a tremendous amount of energy slapping fives, raising my arms and yelling and screaming and cheering. Whenever the crowds were at least 2 deep I did everything I could to get them cheering. It began to feel like a wave of energy was just following me along the course and pushing me along. The spectators would hear the cheering and see me coming and keep it going. I didn't pay attention to the miles, or pace, I never felt hot or tired, I was just pumped up. I grabbed dozens of orange slices, popsicles, ice cubes, water cups, wet paper towels...whatever was being offered I grabbed and relished! I dashed for all the hoses and sprinklers I could find. All the dashing ended up adding an extra 1/3 of a mile but I wasn't worried. spot me until mile 25. The hills start at about mile seventeen and continue for 4 miles. They felt like speed bumps to me. I cruised up at a comfortable pace but it felt like I was flying because I was passing so many people. At the infamous "Heartbreak" I was giddy and egging the crowd on like crazy. The cruise downhill after Hearbreak was the best. You pass through Boston College with thousands of rowdy college students making tremendous amounts of noise. I was going for broke by now working the crowds. I thought when in the world will I ever be running a huge race like this with all these spectators willing to cheer for me and not be worried about saving all my energy for racing. I had no idea what time I was in for. I knew my average pace had been dropping but I was just having a good time. I kept waiting for my legs to cramp, to get an ache somewhere but nothing. I felt great. I wasn't tired. I found myself at the 40K mark, feeling like I hadn't even started a workout yet. I finally looked at my overall time and realized that if I kept it up I was in for a new personal best. It was shocking. I had no clue, because I wasn't even racing. My heart wasn't beating fast, my legs didn't feel spent. Clearly I was in much better shape than in September for Top of Utah. Top of Utah I didn't go all out but it wasn't just plain easy like this race felt. The final stretch. I literally lost my voice and my arms were sore the next day from all of my "raising the roof!" At mile 25 I searched for Brent but couldn't find him in the crowds. I decided to kick it in hard and my last .5 mile was a 6:03 pace. 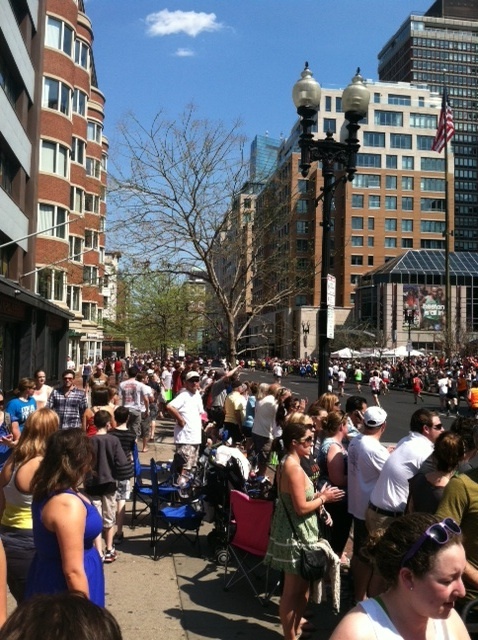 That turn on Boylston I gave it everything I had. When I crossed the finish line I felt like I should be collapsing or tired or something but I wasn't. I was just pumped up that I had PR at 3:13 by 3 minutes and I hadn't even tried. I was even jogging in the finish chutes to pick up my bag and medals and get to the family meeting place to find Brent. All these men around me kept coming up and saying how amazed they were at how strong I finished. It was not a day for many personal records. At the family meeting place with Josse and McKenzie. After quite a journey (it's a long walk!) I made it to the family meeting area. The street was coded alphabetically. I ran to the "D" ready to jump into Brent's arms....and he wasn't there. Deflated I waited. And waited. And waited. With no cell phone I had no way to get a hold of him. I borrowed several phones around me to call but he didn't answer. Finally, he answered when I called. He was fighting all the road closures and couldn't find his way. At last he made it. Probably 35 minutes after I finished. It was very anti-climactic. To make things worse, he didn't have my phone. All along I assumed I must have left my phone with him. McKenzie had come in by now. She finished about 20 minutes after me. We went looking for Josse and didn't find her until about 45 minutes later. Josse was also very frustrated as the heat really had taken a toll on her race. Brent had taken a taxi and been at 3 spots on the course looking for me. I missed him every time! Melody ended up having a good race as well, coming in several minutes before me but I never saw her after the race. Brent and I spent several extremely frustrating hours walking all over searching for my telephone and the earring his mother had given me. We didn't find either. It put quite the damper on the day. Finally we put it out of our minds and just celebrated. We went out to eat at the great Italian restaurant we found a few years ago, I even got an ice cream cone with an unusual sugar craving I had. The day cooled off significantly in the afternoon and the wind picked up as a cold front moved in. It was a gorgeous evening. 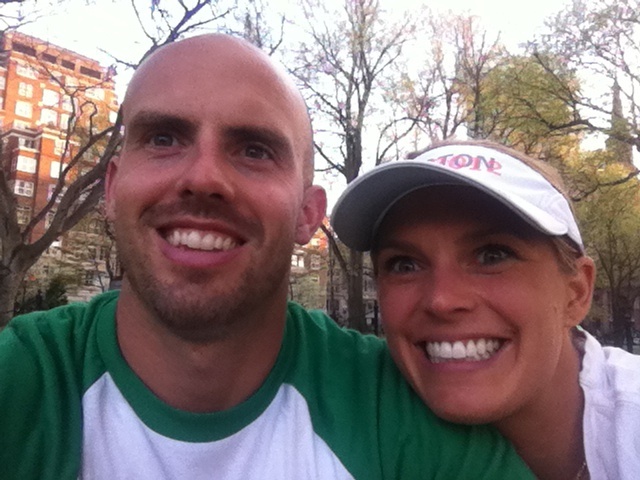 We layed on the grass in the park and relished all the good things about the day and my race. Slapping high fives like a wild woman! Sometimes I almost got knocked over! I include all of this information to make myself feel better and anyone else who ran in the heat last Monday. We all need an ego boost to help us cope with our times. Those people and events I invest a great deal of time in run the danger of becoming highly emotional. Why do I ever wonder where Callista gets her wild emotions? Boston was no exception. 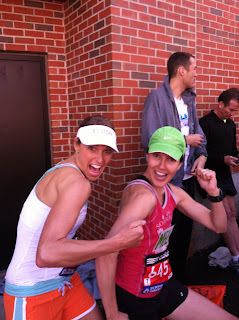 I think this race committed me to the kind of runner I want to be. I read "Born to Run" on the plane ride out and loved it. There is no doubt I have a dogged, competitive side to my personality. However, when competition strips the fun, when it gets in the way of relationships or other higher priorities I'm willing to give. The give doesn't always come without regrets (that darn perfectionist) but at least I hope it always comes. I absolutely love running. I love the camaraderie. It gets me out of bed every morning. I love the high of an intense workout 2 hours before I was certain I would never be able to accomplish. I love pushing and pushing and seeing just how far I can go. I love my children's disturbed questioning if they ever wake up and find me still in bed. "Why aren't you out for a run mom?" I learned I can't make an individual sport a team sport, even for brief moments. It really isn't fair to me and most importantly not to anyone else. An unfair and uncalled for pressure or awkwardness before and after can result. Unless it is a totally unselfish effort to aid someone else who is sincerely asking or in need, I'll just keep my mouth shut. toned body but this is a bit intense. I had no need to panic when all my well laid plans dissolved. I pulled it out just fine spur of the moment. I knew there would be so many factors out of my control. There were. It was just a far bigger factor than I imagined. I can do that in life. I don't have to have a spreadsheet to help me conquer every hill. Given the circumstances I feel I ran a fantastic race. So why do I feel incredibly frustrated and disappointed? Because I wanted more. I know I was capable of running a much faster race. For the first time I felt ready not just to "run" a marathon but to "race" one. I lost that in the weather. But I will take this little victory of running smart and safe and decently fast. And I will give my body a great big hug for not falling apart in the heat!